This is the first of a 3-part series on eliminating foods from our diets (for health reasons). In this post, I will simply share a Q&A from an interview I did with Rande McDaniel at the Vegetable Centric Kitchen. This gives my basic opinions on the topic, and in the next 2 posts, I’ll elaborate some more. 6. Before your book I read in many eating-disorder style books that we should never restrict anything, or omit any food from our diets or we’re guaranteed to binge on it. On some level I believed this so yes, it lead to bingeing. What are your thoughts on someone who wants to take on a healthy diet/lifestyle that may omit certain foods (processed foods, etc)? I certainly don’t believe that omitting something from your diet guarantees that you will binge on it. There seems to be a divide in the eating disorder community with the majority of eating disorder experts saying that we should not omit any foods, but other treatment groups – like Food Addicts Anonymous, and Overeaters Anonymous – saying that eliminating problematic foods is necessary for recovery. Quite simply, I don’t believe that the types of food you eat or don’t eat cause binge eating – the urges to binge cause binge eating. Might eliminating a certain food – or on the flip side, eating a certain food – lead to an urge to binge? Absolutely. But, we always remain in control of what we do when we experience an urge to binge. So, whether you chose to eliminate certain foods for health reasons or not, it doesn’t have to affect recovery. 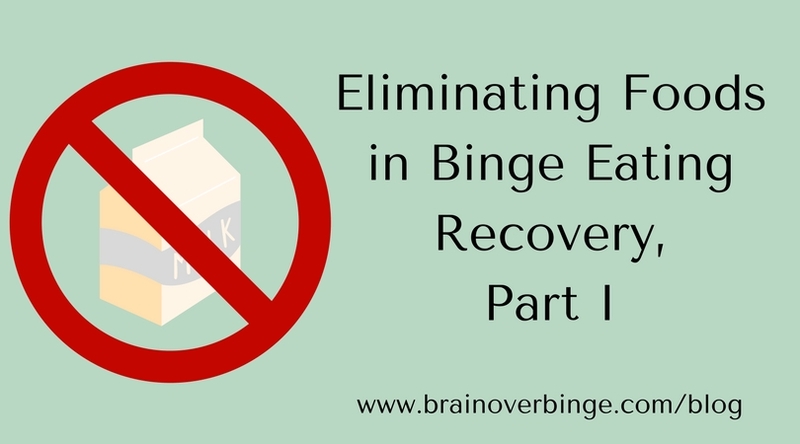 I personally believe that, when recovering from binge eating, it’s most helpful to allow all types of foods in moderation so that you can de-condition associations between eating certain foods and binge eating. The good news is: when you feel you can control yourself around any food, you are free to make any dietary changes you see fit. I am trying to keep a narrow focus on using my own experience to help people stop binge eating, not necessarily to have a perfect diet or maintain a perfect weight, because I am not an expert in those areas. However, I will mention a few things I personally believe are important to remember if someone wants to implement healthy dietary changes. First, I think it’s very important to make sure to eat enough. It’s easy to become overzealous about a healthy diet, and in so doing, deprive the body of necessary calories, which can lead to strong survival-driven cravings and even urges to binge. Second, I think it’s helpful to remember that the body and brain will likely protest even a healthy change in diet. We become accustomed to eating certain types of food, and even though avoiding them might be beneficial, the body/brain may still react with strong cravings for the foods we are used to. However, if we can stick with it, healthier eating habits will become the norm, and cravings for the unhealthy habits will subside. The third thing I think is important to remember is that maintaining an extremely healthy diet is difficult, so I think it’s important to cut yourself some slack if you can’t always eat perfectly. I think having the mindset that you can never “break” your healthy diet can cause some people unwanted stress, and it can also lead to a tendency to overindulge when they do eat something that’s not healthy. Sure, you might chose to have some processed food now and then even while trying to lead a healthy lifestyle; but it doesn’t have to lead to overeating or binge eating. See Part II and Part III of this series for more. If you want more help in ending binge eating, and direct coaching from me on issues like the one discussed here, you can learn about the Brain over Binge Independent Study Course & After Course Support, which is available for a discount until May 1st, 2018.